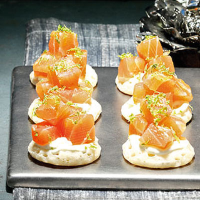 This take on the classic canapé uses smoked salmon tsar fillet, the best meat from the fish. Cut the fillet into 1cm cubes. Put in a bowl with half the lime zest and the sake and mix well. In another bowl, mix the crème fraîche and wasabi paste together. Dot each blini with a blob of wasabi cream and top with salmon. Sprinkle over the remaining lime zest and serve.